10 July 2013 – Going Fruity!! Well the new catalogue has been out for a week now and it is full of lots of fabulous new stamp sets, designer series paper and new colours!! I love the names of the new in colours, especially Crisp Cantaloupe. I wanted to show case the new in colours at my catalogue launch last weekend, so I did a bit of stalking on Pinterest!! I found this lovely card by Marisa Gunn, which also highlighted the Soho Subway DSP. I also wanted to share this card that I found on Pinterest here. It reminded me of the Cathedral Window quilt that my mum made years ago. This was a fun card to make. 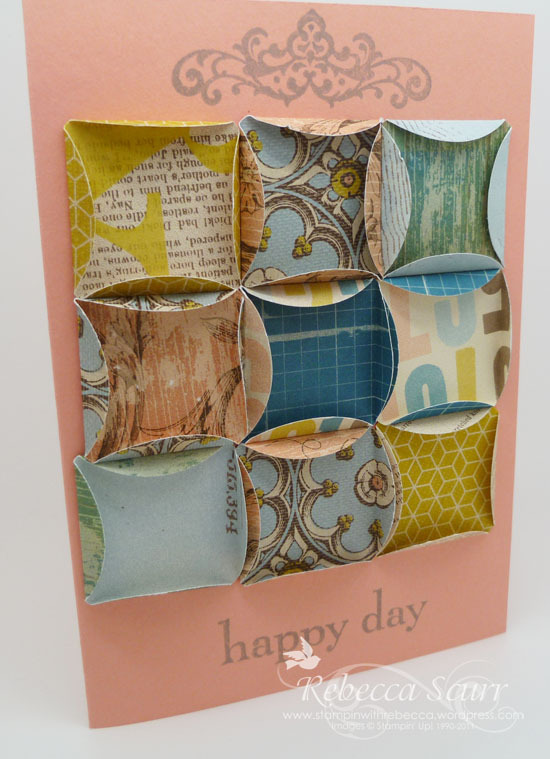 I punched 9 1 1/4″ circles and did a card board 1″ square punch which I used as a template for folding up the edges. I used the new Smoky Slate ink for the sentiments which are from the Happy Day stamp set. Accessories: 1 1/4″ circle punch, 1″ square punch. If you would like to host a workshop and see some more exciting new products or would like a copy of the new catalogue, please contact me at stampinwithrebecca@yahoo.com.au or 0408 193 792. 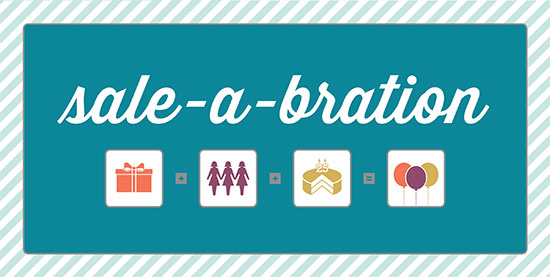 22 January 2013 – Sale-a-bration time!!! * Spend $100 and choose 1 free item. So if you spend $250, you can choose 2 free items. * Host a party and have $300 in sales and receive a pack of silver glimmer paper as well as the usual hostess benefits of $50 free product. * Host a party and have $600 in sales and received a pack of silver glimmer paper and a free product bundle consisting of a stamp set, ribbon, buttons and designer series paper and the hostess benefits of $100 free product and 1 half price item. 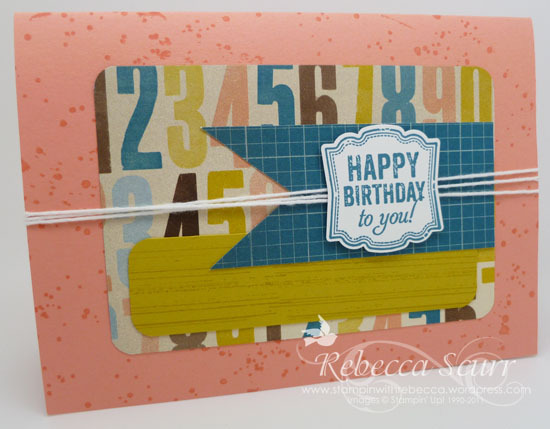 * Join the Stampin’ Up! family for only $169 and choose 25% more in your starter kit. That’s $294 worth of product for only $169. If earning freebies appeals to you, contact me arrange a party or place an order. Email stampinwithrebecca@yahoo.com.au or phone on 0408 193 792. I’ve been able to have a play with some of the SAB products and they are all so nice!! My team has been doing a swap and I’ve been receiving gorgeous cards in the mail (so much better than bills!!). I was inspired by the talented US demo, Mary Fish (check out her blog here). I used the 1″ square punch to punch out the Sycamore Street Designer Series Paper. I did two squares using the new Vine Street embossing folder (I love embossing!!). 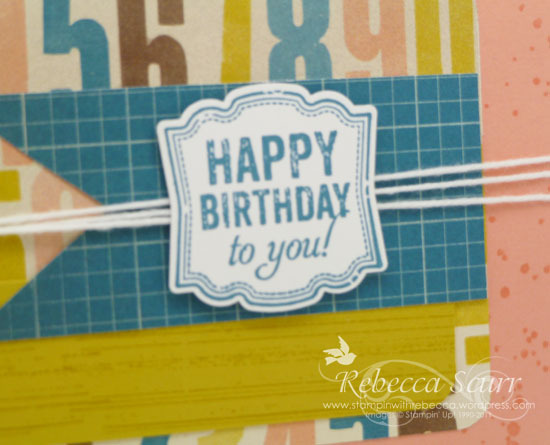 I then stamped the birthday sentiment from the Pretty Petites stamp set and punched it out using the Petite curly label punch. It is one of the cutest punches ever!!! 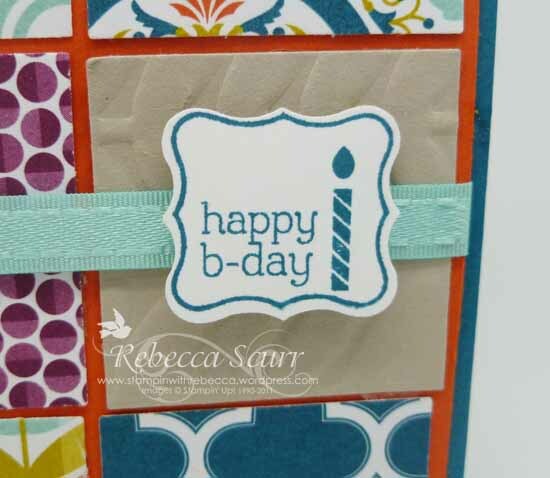 I used the Sycamore Street ribbon and button pack as well. I hope the girls in the team like their swap!! 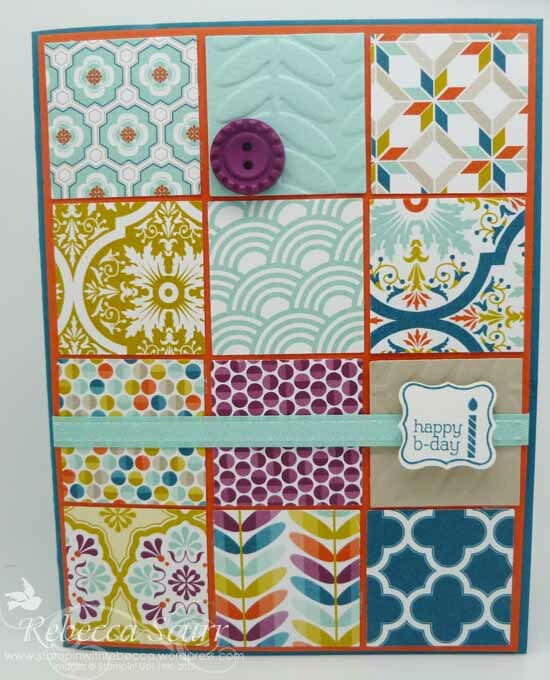 Accessories: Big Shot, Vine Street Embossing folder, 1″ square punch, Scyamore Street ribbon and button pack.